Yup. I believe I have one of these covers laying around if someone really really wants one. I don't know if I would say I really really want it, but I would use it if I had it. Lycra saddles can be very comfy. Two of my bikes, including the Ironman, have Lycra fabric over foam saddles -- not just Lycra/foam add-on covers. The Ironman came from the seller with an old Terry Georgena saddle, which resembles a Selle Turbo with a shorter nose. It's so effective I don't really need padded shorts. In fact, I get more chafing wearing padded shorts with the Lycra/foam saddles. I may try some unpadded tri shorts for the Ironman bike. And I just wear wicking fabric boxer/briefs under my baggy shorts on the hybrid with Lycra/foam saddle. But it's not a perfect solution. The Lycra/foam saddles get soggy with sweat -- exactly like padded shorts would. And unlike shorts you can't toss 'em in the washer. So I use fabric cleaner/freshener once in awhile on the saddles. And if you get caught in the rain on a Lycra/foam saddle, it's like sitting in a puddle. But for mostly dry climates, yup, the Lycra/foam saddles are very comfy. And most seem to be inexpensive enough to replace every year or so. Although Serfas is among the very few suppliers of Lycra/foam saddles, and most are of the heavily padded comfort variety. 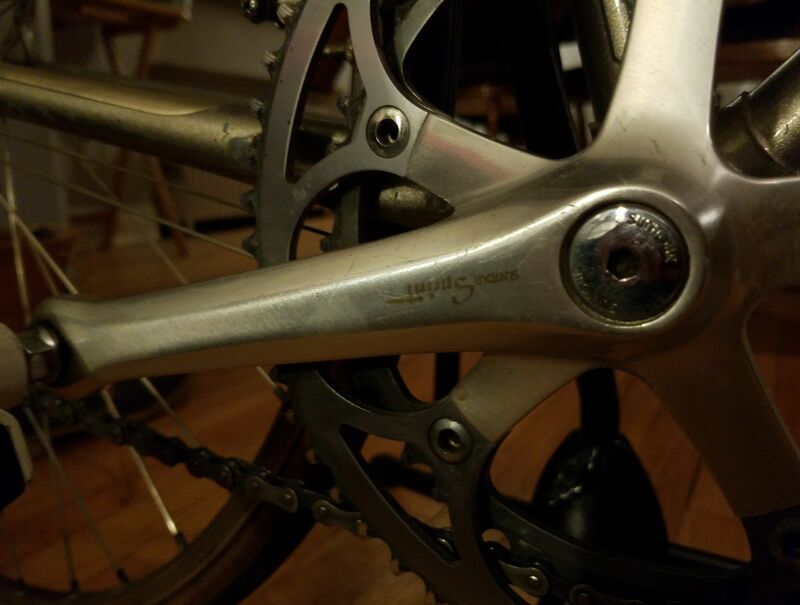 Regarding my August post, I've since replaced the original Suntour 42T chainring with a 39T Vuelta SE Plus. Works fine, although I had to make several adjustments. The bigger drop from 52/39 and vice versa resulted in lots of chain drops. So I had to tweak the front derailleur very carefully to get smooth shifting without dropping the chain. This is crucial to me because I rely on the front derailleur shifts for our roller coaster routes. And I tried combinations of the original 52/42 chainring with the SunRace 13-25 freewheel, which worked well. I really liked the spacing. But I hated the spacing with the 52/39 chainring combo and SunRace 13-25 freewheel. Too much double shifting was needed to find the sweet spot. On climbs it was costing me momentum, fiddling around with shifting both levers. So I switched back to the original Suntour 13-24 freewheel with the 52/39 chainring combo. Not quite as much oomph for steep climbs with dead legs, but the spacing is very good. And the 39/24 combo has been fine for our local hills as long as my legs are fresh. Has anyone replaced the inner chain ring from the usual 42T to something smaller? I'm not sure whether it's feasible or cost effective compared with a compact crankset. I've been trying for almost three months, with lots of HIIT and hill climbs in training, but just can't get along with the stock 42T front and 24 rear cog. Saturday's hilly ride was pretty close to the last straw. I was exhausted by the end of a 64 mile ride with about 2,600 feet of climbing and could barely mash my way up -- walking would have been faster. Not a huge climb for some folks but it's my limit. I get along much better with the 30/40/50 triple and 13-28 on my Univega, even though the bike is heavier than the Ironman. I feel energized rather than wiped out after a long ride on the same route. I did get a 13-25 SunRace freewheel, but I doubt there will be a huge difference for climbing. I could try a 28T maximum freewheel, but I'd need to give up indexed shifting. Seems like changing the smaller chain ring would be the best solution. Thought I would toss up some info here- probably not useful to most, but perhaps helpful to someone down the line while googling. So 3000g total for frame and fork. Thats 6.61# for those who dont speak metric. Less than a Soma Stanyan, I think. For sure less than a Stanyan. The Stanyan is listed at 4.7# for a 52cm frame. So add 11cm to that and only 2.88oz and you have the Ironman frame. My 87 Miami Vice biopace chainrings are kinda wobbling. Is that a chainring or crankarm problem? How do I fix it? My 85 Ironman has a suntour sprint crankset. Original owner says he bought it this way. Maybe it was replaced in the bike shop? It's weird because the chainrings are a similar dark grey to pictures of the stock chainrings I've seen on the internet. SN is N5E512. Definitely not OEM on the Ironman. Centurion Facet is the only model I know of that had Sprint parts, and I'm not even sure about that. RJ the Bike Guy's videos just recommend trial fitting the right crank/chainrings on all four surfaces of the square taper spindle and choosing the position that wobbles the least. Then switch the left crank to suit the position of the right. Unfortunately I watched that video after I'd already reinstalled the right crank/chainrings so I just left it as-is, with a tiny bit of wobble. Continental Ultra Sport 2 in 700x25 fit fine on my '89 Ironman Expert, but I wouldn't push it to 700x28 in this tire, and Contis tend to run a bit smaller than spec in some models. On the back, there's about 1/8" clearance between the top of the tire and the bottom of the brake arm crossover. That's the tight spot. On the front there's 1/4" clearance between the top of the tire and bottom of the head tube. Probably enough room for most 700x28 tires. But I wouldn't care to run a wider tire in front than in back. The 700x25 Ultra Sport 2 appears only very slightly larger than the 700x23 Schwalbe One V-Guards I just replaced. The overall ride is very similar, but the larger Conti's tame the road chatter better on chipseal. They feel slightly squirmy on fast curves, but I don't know whether the tires are broken in yet, or whether it's just pushing the capability of the narrow Araya CTL-370 rims, which originally came with much narrower tires (700x18, I think?). Loved the Schwalbes and wanted a set in 700x25, but they're too pricey. And the rear tire was nicked and cut pretty badly from glass and broken slate on my rural rides (housing construction, lots of debris falling off trucks, and roadside bars with patrons smashing glass everywhere). I continued riding the rear Schwalbe for a couple of months despite the cuts, but a friend who stopped to chat last week gave my tire the stinkeye and said I should replace it. If it was that obvious, it's overdue. The front tire still had some life left. I got 1,700 miles out of the rear, and could probably ride another 300-500 on the front. Not bad. Tough tires too, for lightweight racing quality -- the thin puncture shield held the cuts together and only the worst of three fairly serious cuts was starting to avulse through the puncture shield. Update 2/26/18: After riding the Conti Ultra Sport 2 in 700x25 for a few weeks -- about 8 rides, just over 300 miles -- I wouldn't want to try 700x28 on the Araya CTL-370 rims. The 700x25 Ultra Sport 2 roll comfortably straight ahead but feel a bit squirmy on fast turns. I can also feel a bit more wind resistance from strong cross winds. It's not a huge factor and probably won't matter if you're not turning at racing speeds. But these CTL-370 rims were originally fitted with 700x18 to 700x20 tires. So 700x23 is probably the sweet spot for overall performance and comfort, including turning. Otherwise, so far, so good with the Ultra Sport 2. Next time I'd get 700x23. Outstanding report. Useful in a big way. Anybody know what's going on with the Vintage Centurion website? I think it's been down a while. Hmm... it seemed to be up only a week ago. I may have been viewing a cached version. Getting a DNS error now. Perhaps the owner let the domain go, or forgot to renew. Most of the site is archived via the Wayback Machine, minus the photos and graphics. Unfortunately the images appear to have dropped off Google cache. Well its flesliders website, you could pm him. 1989 Centurion Dave Scott Ironman Expert. 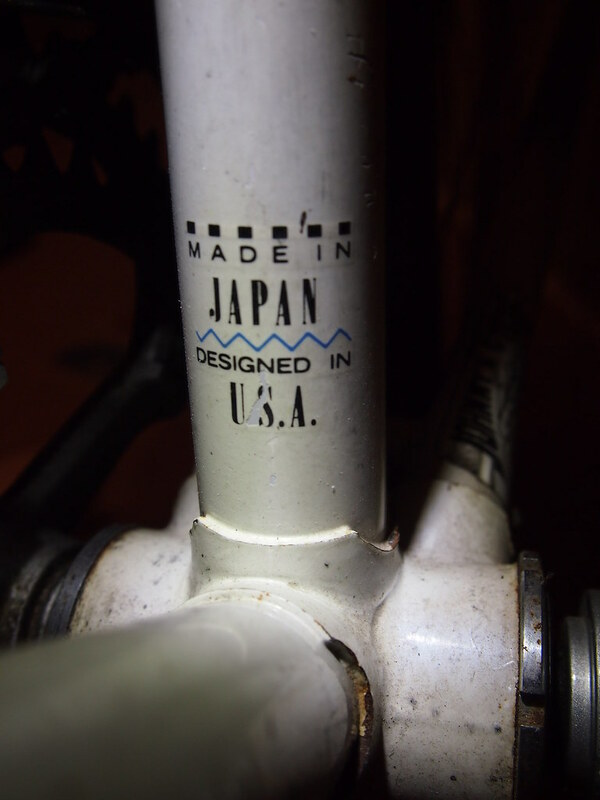 "Smoke on the Water"
Seat Tube Decal(s): Clear/colored Tange at the top, Clear/colored Quality from Japan/Designed in USA at base. Robbie, here is a pic of the lower seat tube decal on my '89 Expert. Slight wording difference from what you posted in the specs on page one. A different variation? 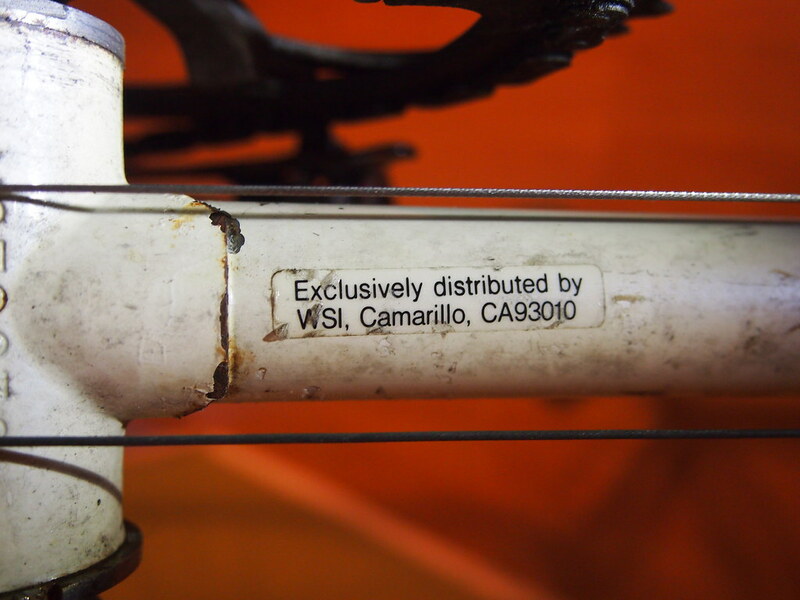 There is also a sticker under the down tube, near the bottom bracket. I'm presuming this would only be for the USA market? Here's an Ironman at a decent price...athough it's been bastardized a bit! Last edited by 67tony; 03-28-18 at 02:31 PM. Here's an Ironman at a decent price...lthough it's been bastardized a bit! That's a '86 52cm. Looks original except missing 600 6 speed shifters, front and rear derailleur, and wheels. Still...a good bargain. Good catch. Thanks. I've corrected the initial post. Last edited by nesposito; 03-09-18 at 10:19 PM. Congratulations, Looking forward to your pics. Awefreakingsome. One of the best schemes. Can't wait to see it. I thought they were Experts, but time has passed and my mind is frail. I did do a nice and cold 42 miles today on an '89. Was this the one that was just on Phoenix Craigslist? That looked like a super nice bike.